In this quick blog update, we will share with you guys the changes we will be making to a few of our blog series. First up is our Mask Monday series. As is evident from last year, we both use masks way more often than just on Mondays. Saving up our reviews of the masks we use until Monday meant we had a lot of backed up reviews that never got posted. Which is a shame because there were a lot we wanted to share with you guys. So, going forward, we will be posting mask reviews whenever we finish writing them and they won't be just on Mondays. Momo. We've shared a few posts here and there on the blog regarding our mischievous fur baby but most of his recent updates can be found on our Instagram. When we talked about changing up a few of our blog series, his came up. It's surprising (or perhaps unsurprising by now) how many questions we get asked regarding our fluff baby. Whether it's on the streets or here on the internet, many people either haven't heard of his breed or can't believe that he is what he is. The questions we get asked range from the usual to some pretty ridiculous and funny ones. It's truly never a dull moment with the little guy. So, we've decided to revive Momo's series on the blog. In his series, we'll share about his doggy adventures and answer your questions regarding him and his breed. Last but certainly not least, the Sample Saturday Series. We started our Sample Saturday series in late 2015 but we decided to stop it in 2016 because we wanted to revamp it. We put a lot of thought into the areas we wanted to keep and the parts we wanted to change. Here's what we've decided on. 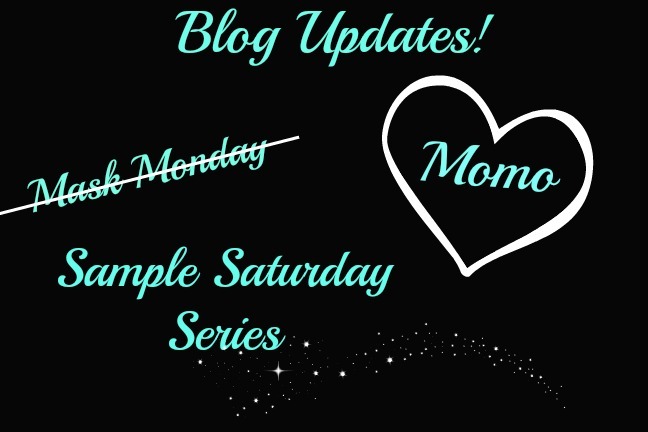 The revamped Sample Saturday series will be a weekly series shared every Saturday starting February 2017. We'll be sharing mini reviews of our sample products. The products must be either deluxe size products or if they are pouch sized, there must be multiple pouches of said sample. This allows us to test the products for a longer period and share more information about it with you guys. If we have samples that aren't deluxe in size or come in multiple pouches, we might do a combined post on them to share their general information (like scent, texture, color, etc.) and product descriptions. Alright! That's all for this blog update! If you have some blog series suggestions for us, please let us know in the comments below. Thanks for reading everyone!